This Pergola tapestry shows a beautiful garden scene shaded by an extensive pergola. Columns and vines are present in the scene which suggests a misty morning. The greens, blues and mauves provide a beautiful color enhancement to the stone colors in this scene. The light is soft and is softened even more by the shade of the pergola. 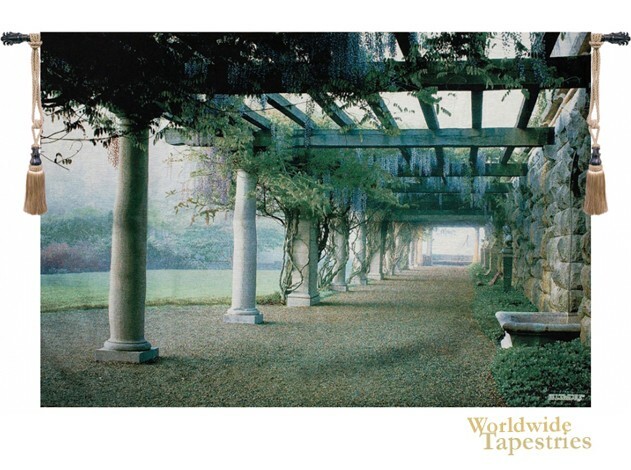 This Pergola tapestry is backed with lining and tunnel for easy hanging. Note: tapestry rod and tassels, where pictured, are purchased separately. Dimensions: W 70" x H 50"